NARITA, CHIBA PREF. - You can’t choose your neighbors, as organic farmer Takao Shito knows all too well after a decadeslong battle against Narita International Airport — the country’s second-busiest. His farm is virtually surrounded by the airport, and jets from around the world roar down right next door to his rows of peas and radishes, whose green leaves wave in the spring breeze. “You get used to the noise,” the soft-spoken 68-year-old said on his farm, most of which is only accessible via tunnels underneath the airport. “These are pieces of land farmed by three generations for nearly a century, by my grandfather, my father and myself. I want to continue living here and farm,” he said. His fight, which is being waged along with a handful of other families, has proved a major headache for the airport, which marks its 40th anniversary this year. It is Tokyo’s main international gateway and handles 40 million passengers and 250,000 flights a year. Narita has been controversial since it was first proposed by the government in 1966 as a three-runway facility, sparking protests by activists and farmers, including Shito’s father. The demonstrations turned violent, ending with the deaths of several police officers and protesters. The airport opened in 1978, with authorities only apologizing years later for their heavy-handed response to the protests. But the local opposition forced it to operate with just a single runway until 2002, when a second one finally opened. 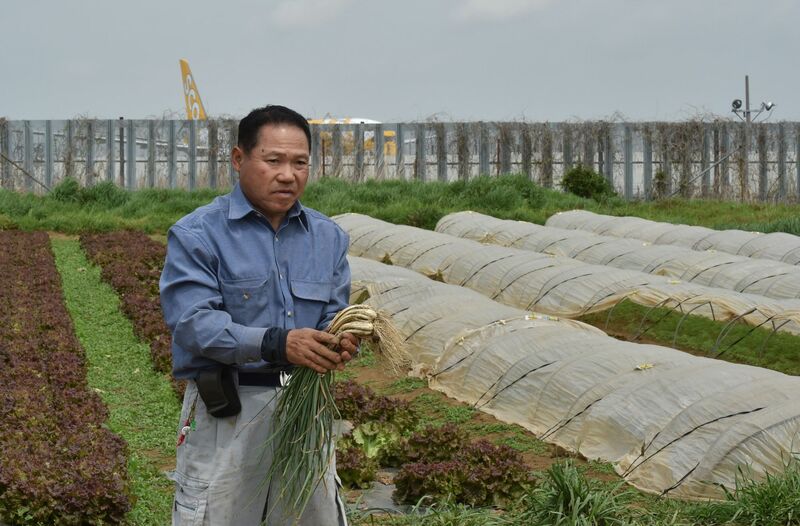 The airport bought farm lots adjacent to the new route from the legal landowners, including some who had rented to Shito’s family for decades. But Shito refused to move, arguing his livelihood depended on the land and citing the Agricultural Land Act, which gives farmers broad legal protection. So the airport altered the route leading to the runway, which now curves around Shito’s farm, encircling one of his lots. 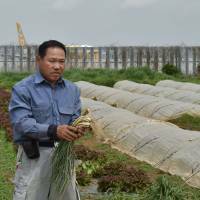 It won’t run near Shito’s farm, but the airport faces more negotiations with other nearby farmers. Seen from above, the plots Shito and his neighbors farm are fenced-in brown soil islands, trapped inside a web of taxiways. With planes thundering in and out of the airport throughout the day and into the night, it is hardly an idyllic farming existence. “This is not at all about money,” he said, in a blue, buttoned shirt and cargo trousers, his hair well-groomed. 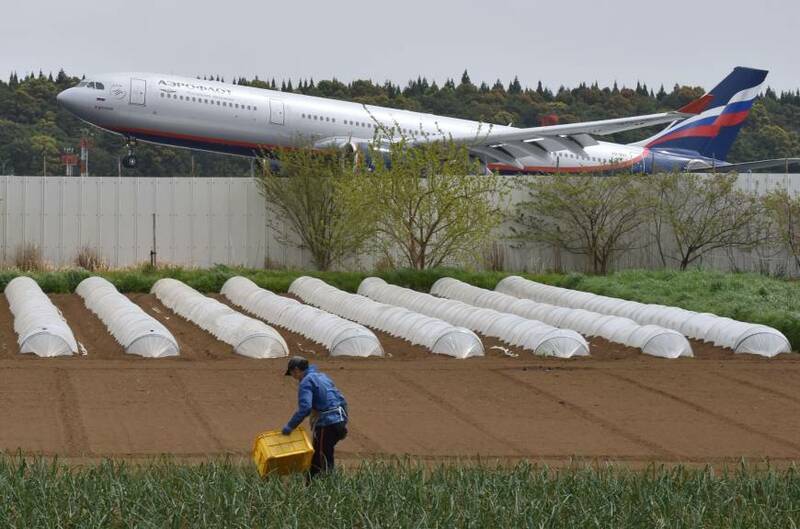 While the area around the airport may not seem the ideal location for organic farming, air and water quality monitors in and around Narita show no sustained and elevated levels of contaminants. 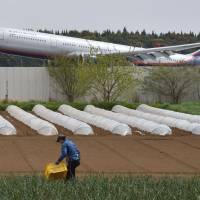 The airport has already won a major case against Shito and convinced some other farmers to take compensation to move. “We will determine our future actions by consulting with attorneys and others concerned while also reviewing the situation,” the airport said in a response to written questions. Shito’s tense relations with the airport lead to occasional run-ins with security. “I have fun growing vegetables here. This is my life: growing vegetables on this soil. They taste different,” he said. At a recent hearing at the Chiba District Court, roughly 60 activists filled a courtroom and loudly heckled the judge in a noisy show of solidarity. Some even want the entire airport to be dismantled and the region returned to its pastoral past. Nobuharu Ito, 71, who began protesting more than four decades ago as a university student, said he was moved by Shito’s commitment to his land. “Mr. Shito’s way of living, how it’s not about money, I think it resonates with people now more than ever,” he said. Despite his decadeslong feud with the airport, Shito said he would happily continue coexisting with Narita. “When the government does and says something, I think most people accept it or give up without questioning,” he said. And for now he has no plans to stop fighting.